Tuberculosis (TB), the word which generates feelings of fear, anxiety, stigma, and despair, is known for centuries, to harass, weaken, and making poor a large section of the population. It is accounting for 2.5% of the global burden of disease and 25% of all avoidable deaths in developing countries. The World Health Organization (WHO) has identified 22 high-burden TB countries which collectively contribute 80% of the global burden ofTB, India ranked No. 1 among them. TB is the oldest malady of human poverty and sufferings and remains a major public health problem despite significant socioeconomic development, advances, and availability of technology. It causes immense morbidity, mortality, and distress to individuals, families, and communities. There were 87,147 cases registered for the treatment under Revised National TBControl Program (RNTCP) in West Bengal in 2015. The WHO recommendation for Stop TB strategy for TB control is Directly Observed Treatment Short Course (DOTS) strategy. It is a community-based TB treatment and care strategy which assimilate the benefit of supervised treatment and benefit of community-based care and support. Bankura district is economically underdeveloped and is one of the backward districts of West Bengal. As per 2011 census, there are about 10.3% population belongs to scheduled tribe (ST) and 32.7% of population belongs to scheduled castes (SC) resides in Bankura district. According to End TB strategy, our aims are to cut new cases by 90% between 2015 and 2035 and to ensure that no family is burdened with catastrophic expenses due to TB. In spite of administering DOTS, 4184 cases were registered in 2015 in Bankura district of West Bengal. Among them, 2136 patients were new smear positive at the initiation of treatment and sputum positivity was noted in 75% of the new pulmonary TB patients. Health-care system is dependent upon availability, affordability, efficiency, feasibility, and other factors. Patient's satisfaction is recognized as an important parameter for assessing the quality of patient-care services. Satisfaction can be described as the connection between patents' expectations before receiving care and the perception of care actually acquired from the services. It emphasizes the different aspects of health facility: prompt care, being treated politely and respectfully by health-care providers (HCP); timely accurate diagnosis and hope of a good prognosis and finally the cost of treatment should be within the individual's budget. It also considers the technical quality of the medical care received. Patients usually give importance to the physical structure and organization of the health-care services, the availability of human resources and materials. Therefore, just providing anti-TB medication is not sufficient to ensure that patients to be cured. After extensive literature search, a study on patient satisfaction of TB patients in Bankura district of West Bengal was not found. With this backdrop, the present study was conducted to assess the patient satisfaction and its correlates as well as to find out effect of client's satisfaction on treatment outcome rates in Lokepur TU of Bankura, West Bengal. A clinic-based descriptive, cross-sectional study was carried out for 1 year in Lokepur TU which is located within the campus of Bankura Sammilani Medical College, at Bankura, West Bengal. It was covering 3.5 lakh population. There were total 44 DOTS centers under that TU. Among them, 16 DOTS centers were in Bankura-1 community developmental block (CDB), 23 DOTS centers were in Bankura-2 CDB, and 5 DOTS centers were in Bankura Municipality. All the adult (≥15 years) TB patients registered in Lokepur TU of Bankura and receiving Category I treatment from DOTS centers constituted the study population. At first, Lokepur TU of Bankura district was chosen purposively. Among the 44 DOTS centers, 50% of the DOTS centers were selected by simple random sampling (SRS). Then, complete enumeration of all the adult TB patients receiving Category I treatment for ≥1 month, in intensive phase, and registered under DTC TU from June to October 2015 was done from the selected DOTS centers. Assuming 50% of the patients are satisfied with the DOTS services and applying the formula n= (Z2 p q)/l2 we got n = 96 (where Z = 1.96, P = 0.5, q = 1-p = 0.5, l = absolute precision, that was assumed 10%), considering 10% nonresponse rate n = 96 + 9.6 ≈ 106. According to inclusion criteria, number of patients receiving Category I treatment from 22 DOTS centers and registered from June to October 2015 under DTC TBunit was 115 (which was the final sample size). One predesigned, pretested interviewer-administered questionnaire containing both open- and close-ended questions (in Bengali language) was the study tool. At first, it was prepared in English and subsequently translated into Bengali by language experts. Then, it was retranslated into English and compared with previous English version. Any discrepancy was rectified by language experts. Finally, the content was validated by the faculty members of Community Medicine Department, BSMC. The content validity ratio of all the items of patient satisfaction scale exceeded 0.54. The questionnaire was pretested on 15 adult patients receiving Category I treatment under Amarkanan TB Unit fulfilling the same criteria of sample population. Modification of question wordings was done to make it lucid, intelligible, and in logical sequence. Socioeconomic status was calculated according to the updated BG Prasad Scale 2014. Patient satisfaction was assessed by 5-point Likert scale. There were 13 questions and each had five options – very satisfied, satisfied, no response, dissatisfied, and very dissatisfied. Score 5 was given to very satisfied, 4 was given to satisfied, 3 was given to no response, 2 was given to dissatisfied, and 1 was given to very dissatisfied. Maximum score was 65 and minimum score was 13. Treatment outcomes were reviewed from TB register and TB treatment cards. Cronbach's alpha of the patient satisfaction scale was 0.849 which showed good reliability. “Alpha if item deleted” was lower than the overall alpha for all the questions so no question could be deleted from the scale. The study proceeded after obtaining ethical clearance from the Institutional Ethics Committee of Bankura Sammilani Medical College. Chief Medical Officer of Health, Bankura and District TB Officer were informed regarding the study. Before starting the interview, written informed consent was obtained from all participants. In case of illiterate patient, at first, the consent was read in front of a witness, then the left thumb impression was taken along with the signature of that witness if the person agreed to participate in that study. The data were collected by exit interview of the patients and by review of records. Interviews were conducted on DOTS days, i.e., Mondays, Wednesdays, and Fridays from July 2015 to November 2015. All the patients had their treatment outcome by May 2016 and these outcomes were obtained from TB register of the Lokepur TU. Data were entered into Microsoft Excel Spreadsheet. Analysis was done with the help of MS Excel and statistical software SPSS 22.0 version. Mean, Standard deviation (SD), and proportion were calculated for the description of baseline characteristics and patient satisfaction. Relationship between the treatment outcome and patient satisfaction was calculated by bivariate analysis like Chi-square tests (two-tailed). In this statistical test, P ≤ 0.05 with 95% confidence interval was considered statistically significant. Multivariate analysis was done using binary logistic regression to find out the interrelationship of different variables as well as to assess the strength of association with patient satisfaction, while adjustment done for all the possible confounders. The baseline characteristics which were significantly associated with patient satisfaction in bivariate analysis were taken into consideration for logistic regression. According to the treatment outcome of the RNTCP guideline, these were cured, treatment completed, treatment success, treatment failed, died, lost to follow-up, and not evaluated. Not satisfied – who scored <60% in 5-point Likert scale. Average age of the patients was 38.99 ± 15.38 (mean ± SD) years; range was 16–85 years. Almost 90% patients belonged to productive age group (15–59 years). Proportion of male patients (57.6%) was more than female patients. About 62% patients belonged to SC, ST, and other backward classes. Illiterates were about 52% of the patients. Almost half (50.4%) of the patients were laborer by occupation. Most of the patients (80%) were married. About 49% patients belonged to joint family. Almost 93% patients belonged to lower (IV and V) socioeconomic status. Nearly 75% of the patients had a history of substance abuse. About 63% of the patients had not taken decision in seeking treatment by themselves. Comorbidity was present in 10% of the patients and 4.3% had confirmed diabetes. Initial home visit was not done for almost 70% of the patients. Proportion of pulmonary TB patients (66%) was more than the extrapulmonary TB patients. Cure rate was 53.1% and treatment completion rate was 33.9%. Hence, treatment success rate of Category I TB patients was almost 87%. On the other hand, 7.8% were lost to follow-up, 3.4% was not evaluated and death rate was 1.8%. Among the participants, 24.35% of the patients were not satisfied with the given services. Median score of treatment success patients (49.5) was more than the other group (i.e., lost to follow-up, not evaluated, and died) (35). However, the interquartile range (IQR) for the treatment success patients was less (10) than the other group (23). That means, there were more variations in patient satisfaction score in the other group than the treatment success group [Figure 1]. More than 70% patients were satisfied regarding distance of the DOTS center from home, travel time to reach center, and cost of travel. However, about 35% patients were dissatisfied regarding waiting time before the test, 32% patients were dissatisfied for waiting to get confirmed report and 42% patients were dissatisfied for waiting to get medicine at the DOTS center. Almost 35% patients were dissatisfied about lack of presence of health worker during the delivery of medicine and counseling before initiation of treatment. Almost 38% patients were not satisfied with the working hours of the DOTS centers. More than 75% patients were satisfied with behavior of the health worker and the attention they got from the health worker. Whereas, almost 60% patients were dissatisfied with the general condition of the DOTS center. 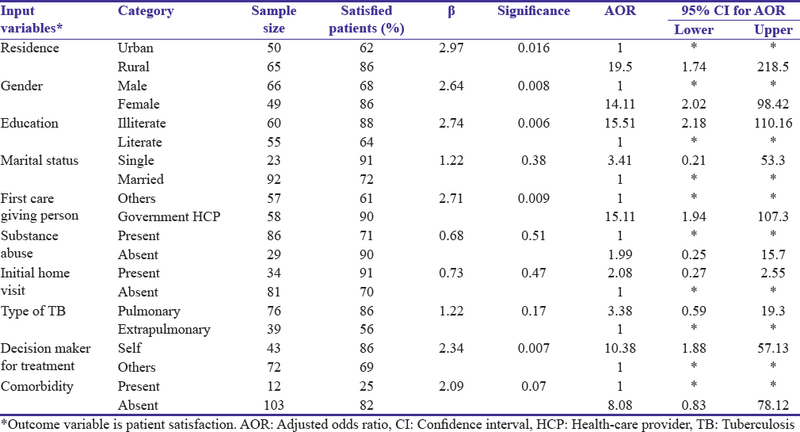 Overall satisfaction was found in about 54% of the patients [Table 1]. Treatment success rate was higher among the satisfied patients (97%) than the not satisfied group (57%) and the difference was statistically significant [Table 2]. It was revealed by logistic regression that patient satisfaction was statistically associated with gender, residence, educational level, first caregiving person, and decision maker in getting treatment while adjusting the effect of other variables in the regression model. Rural patients were 19.5 times more satisfied than the urban patients. Female patients were 14.11 times more satisfied than the male patients. Illiterate patients were 15.51 times more satisfied than the literate ones. If the first caregiving person was government HCP, then patient satisfaction was 15.11 times higher than the others. When the patient himself/herself had taken decision for getting treatment the satisfaction was 10.38 times higher than another group [Table 3]. Proportion of male patients was more than the female patients in the present study. Gajbhare et al. and Costa et al. also found the male preponderance., The reason for higher incidence of TB in male could be attributed to their gender-specific role that would require them to have many social contacts. This, in turn, could have increased their TB exposure risk. The present study revealed the proportion of rural patients was more than the urban patients. Dudala et al. in their study showed the similar finding. Whereas, a study conducted at Aligarh, Uttar Pradesh in 2013, by Kanungo et al. showed 54.2% urban patients, and 45.8% rural patients. The present study was conducted in Bankura district of West Bengal, where rural areas were more than the urban areas. It might be the reason of getting more patients belonged to rural areas in the present study. The present study showed almost 52% patients were illiterate. This finding was consistent with the study conducted by Gajbhare et al. whereas Mohamed et al. showed 19.2% patients were illiterate at Tamil Nadu in 2015., This might be the fact that literacy rate in Tamil Nadu was higher than Maharashtra, Bihar, and West Bengal. About half of the patients were laborer by occupation in the present study. Saha et al. also found the same in their study at Kolkata in 2009. However, Kanungo et al. (37.2%) showed lesser proportion of laborer in their study at Aligarh. Majority of the patients (93%) in the present study belonged to lower socioeconomic status. Similar finding was shown in a study conducted by Nelliyanil et al. (95.5%) in Bengaluru. In the present study, almost 40% patients had smoking habit and 24% patients had the habit of alcohol consumption. Mahishale et al. showed in their study in Karnataka that 32.2% patients were smoker and Dudala et al. found 46.97% patients were smoker., Regarding alcohol consumption, Suhadev et al. showed similar finding whereas Dudala et al. showed much higher proportion of alcohol consumption than the present study., Present study showed 4.3% patients had confirmed Diabetes, whereas other studies conducted by Viswanathan et al showed 21.45% and Nandakumar et al showed 24% patients had Diabetes., The lower proportion of Diabetes might be the fact of small sample size of the present study. Qualitative studies on satisfaction of the TB patients are more conclusive than the quantitative ones. In future, it can be conducted among the TB patients to enlighten the dissatisfaction part more elaborately. Knowledge and attitude of the health-care providers are important factors for patient satisfaction which were not been explored in the present study. The present study showed that emphasizing direct observation alone is not sufficient for treating TB; patient satisfaction is significantly associated with treatment success. There should be improvement of infrastructure as well as the services of the DOTS centers in this regard. The urban slum areas should get more concern regarding provision of DOTS satisfactorily. As males are the bread earners of the family, when they get affected with TB they lose their usual job and their families suddenly face an economic crisis. This may be the cause of more dissatisfaction among the male than the female patients. Hence, there should be an arrangement of alternative sources of income for the TB-affected families. Illiteracy leads to ignorance which in turn lead to dissatisfaction to the given services. Literacy status of the population should be increased by intensive efforts. The government of India has started “Sarbasiksha Abhijan,” but educational reforms still need to focus extensively on education and providing financial support for the children of lower socioeconomic strata. Literacy status of the adult population should be increased by adopting “National Adult Education Programme.” Special emphasis should be placed on the education of women, SCs, and STs and other weaker sections of society, who comprise the bulk of illiterate population in India. There is an urgent need for increasing knowledge of the first caregiving persons such asgovernment health workers, traditional healers, and chemist shop personnel to avoid delay in confirmed diagnosis and treatment. Awareness should be generated among the community people by holding meetings and extensive IEC and BCC program, inviting opinions and suggestions from the patients, and encouraging enhanced community participation for bringing about a quantitative and qualitative change in the coverage of RNTCP program. Gupta S. study on performance of DOT providers in Meerut district. Indian J Clin Pract 2012;22:400-4. Available from: http://www.medind.nic.in/iaa/t12/i1/iaat12i1p400.pdf. [Last accessed on 2016 Sept 10]. Global Tuberculosis Report 2014. Geneva: World Health Organization; August, 2014. Available from: http://www.apps.who.int/iris/bitstream/10665/137094/1/9789241564809_eng.pdf?ua=1. [Last accessed on 2016 Sept 10]. TB India 2015 Annual Status Report. New Delhi: Central TB Division, Directorate General of Health Sciences; March, 2015. Available from: http://www.tbcindia.org/documents.asp#. [Last accessed on 2016 Sept 10]. Health on the March 2015-2016. Kolkata: Government of West Bengal; 2016. p. 141-3. Portela MC, Lima SM, Brito C, Ferreira VM, Escosteguy CC, Vasconcellos MT, et al. Tuberculosis control program and patient satisfaction, Rio De Janeiro, Brazil. Rev Saude Publica 2014;48:497-507. Haque MA, Kumar D, Vyas S. A study on socio demographic profile and feasibility of DOTS provider registered under RNTCP in Varanasi district Uttar Pradesh. Community Health 2014;26:107-10. Available from: http://www.iapsmupuk.org/journal/index.php/IJCH/article/download/179/323/. [Last accessed on 2017 Sep 27]. Population Census; 2011. Available from: http://www.census2011.co.in/data/village/326879- uttarbankati-west-bengal.html. [Last accessed on 2016 Nov 22]. Technical and Operational Guideline for Tuberculosis Control in India 2016. Ministry of Health and Family Welfare, New Delhi, India; 2016. Available from; http://www.tbcindia.gov.in. [Last accessed on 2016 Sep 12]. Dudala RS, Rao R, Kumar BPR. A Follow-up Study on the Performance, Outcome and present status of patients treated Under 'RNTCP' in a slum area of Kolkata. Int J Med Health Sci 2013;2:195-204. Available from: http://www.ijmhs.ne. [Last accessed on 2016 Sep 11]. Gajbhare DM, Bedre RC, Solanki HM. A study of socio-demographic profile and treatment outcome of tuberculosis patients in an urban slum of Mumbai, Maharashtra. Indian J Basic Appl Med Res 2014;4:50-7. Available from: http://www.ijbamr.com. [Last accessed on 2016 Sep 05]. Ahmed F, Shrotriya VP, Gupta SB, Kariwal P, Imtiaz D. A study on treatment outcome of tuberculosis patients registered at tuberculosis unit (TU) in Bareilly [U.P. ], India. Int J Curr Med Appl Sci 2013;6:174-6. Available from: http://www.ijcmaas.com/pdffileDownload?id=200. [Last accessed on 2016 Sep 11]. Costa AD, Sanjivani J, Keny SJ, Lawande D. Treatment outcome of pulmonary and extra pulmonary tuberculosis patients in TB and chest disease hospital DOT centre, Goa, India. Int J Curr Microbiol Appl Sci 2016;5:437-41. Available from: http://www.ijcmas.com/currentissue.php. [Last accessed on 2016 Sep 11]. Kanungo S, Khan Z, Ansari MA, Abedi AJ. Role of socio-demographic factors in tuberculosis treatment outcome: A prospective study in Aligarh, Uttar Pradesh. Ann Trop Med Public Health 2015;8:55-9. Available from: http://www.atmph.org/article.asp?issn=17556783;year=2015;volume. Kanungo. [Last accessed on 2016 Sep 11]. Mohamed S, Kanagasabapathy S, Kalifulla S. Socio-economic profile and risk factors among pulmonary tuberculosis patients in Madurai, India: A cross sectional study. Int J Res Med Sci 2015;3:3490-8. Available from: http://www.scopemed.org/?jft=93 and ft=93-1447181622. [Last accessed on 2016 Sep 11]. Saha TK, Chattopadhyay A, Sain S, Boral K, Yasmin S, Basu R. A Follow-up Study on the Performance, Outcome and present status of patients treated Under 'RNTCP' in a slum area of Kolkata. J Dent Med Sci 2013;6:63-7. Available from: http://www.iosrjournals.org. [Last accessed on 2016 Sep 11]. Nelliyanil M, Sharada MP, Joseph N, Basagoudar SS, Jayaram S, Patil DC, et al. Astudy of the socio-demographic profile and treatment outcome of paediatric tuberculosis patients in Bangalore Mahanagar Palike area. Indian J Tuberc 2012;59:207-13. Mahishale V, Patil B, Lolly M, Eti A, Khan S. Prevalence of smoking and its impact on treatment outcomes in newly diagnosed pulmonary tuberculosis patients: A Hospital-based prospective study. Chonnam Med J 2015;51:86-90. Suhadev M, Thomas BE, Raja Sakthivel M, Murugesan P, Chandrasekaran V, Charles N, et al. Alcohol use disorders (AUD) among tuberculosis patients: A study from Chennai, South India. PLoS One 2011;6:e19485. Viswanathan AA, Gawde NC. Effect of type II diabetes mellitus on treatment outcomes of tuberculosis. Lung India 2014;31:244-8. Nandakumar KV, Duraisamy K, Balakrishnan S, Sunilkumar M, Jaya Sankar S, Sagili Kd, et al. Outcome of tuberculosis treatment in patients with diabetes mellitus treated in the revised national tuberculosis control programme in Malappuram district, Kerala, India. PLoS One 2013;8:e76275. Gupta S. Evaluation of patient satisfaction level undergoing DOTS therapy in Meerut district of Uttar Pradesh. J Adv Med Dent Sci Res 2015;3:34-7. Available from: http://www.jamdsr.com/./7.%20EVALUATION%20OF%20 PATIENT%20SATISFACTION%2. [Last accessed on 2016 Sep 12]. 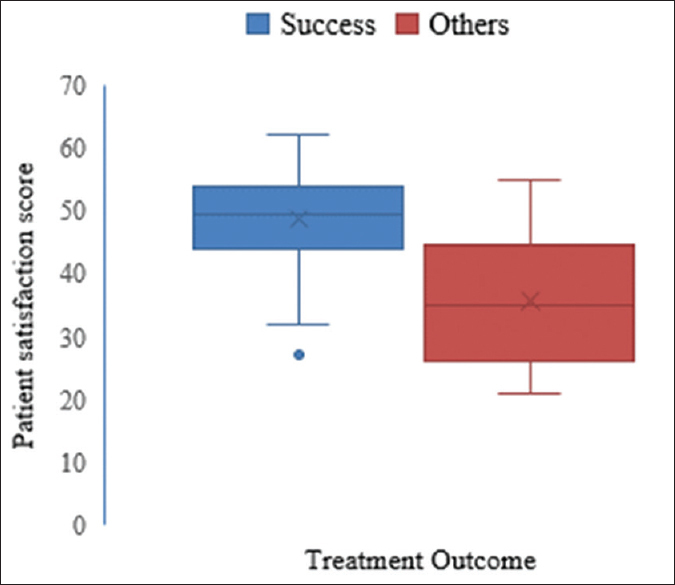 Srivastav S, Mahajan H. Satisfaction levels among patients availing DOTS services in Bundelkhand region (UP), India: Evidence from patient exit-interviews. Ann Trop Med Public Health 2014;7:116-9. Available from: http://www.atmph.org/article.asp?issn=1755-6783;year=2014;volume. Srivastav. [Last accessed on 2016 Sep 12]. Nagpal M, Devgun P, Chawla N. Performance of directly observed treatment provider affecting the treatment outcome of tuberculosis cases in Amritsar city. Natl J Community Med 2016;7:29-34. Available from: http://www.njcmindia.org. [Last accessed on 2016 Sep 10]. Akhtar S, Rozi S, White F, Hasan R. Cohort analysis of directly observed treatment outcomes for tuberculosis patients in urban Pakistan. Int J Tuberc Lung Dis 2011;15:90-6.